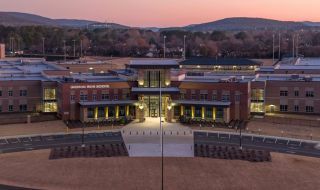 Framingham, MA – Huntsville, Alabama’s newly-built Virgil I. Grissom High School, named for one of America's original Mercury astronauts, is a state-of-the-art educational facility, and its Martha deFord Hayes Auditorium employs a ShowMatch DeltaQ loudspeaker array from Bose Professional. Audiovisual systems integrator ESB Group of Springville, AL, designed and installed a ShowMatch system consisting of a left and right hang, each including an SMS118 subwoofer on top with four ShowMatch loudspeakers below. These are powered by three Bose PowerMatch PM8500N networked amplifiers, and managed through a Bose ControlSpace ESP-8800 processor.